1) What is SEER? Seasonal Energy Efficiency Ratio is used to measure the efficiency of a central air conditioner system’s ratings. Air conditioner with a higher SEER rating will be more efficient. The minimum standard rating increased from 10 to 13 SEER. Even if your air conditioner is only a few years old, it could be inefficient by today’s energy efficiency standards. For example, if your unit is less than 13 SEER, you do not need to replace it but by doing so could save you up to 30% or more on your energy bill. Trane’s full line of air conditioners offer SEER ratings of up to 20. Will installing a programmable thermostat reduce my heating and cooling consumption? Yes, by properly installing programmable thermostats it can reduce the energy bill by 5 to 30%. In addition to installing the thermostat, you need to program a schedule designed not to run the ac unit when not needed. You can save money by turning the air conditioner to a higher setting when no one is at home. How often should I have maintenance done on my air conditioner? To ensure your air conditioner maximum efficiency, you should have it serviced twice a year. We also recommend that you change your filter regularly. Check it at least every month during peak use, and replace it when it look dirty enough to impair air flow. Some air filter, such as media filters and electronic air cleaners, are washable while others are disposable and must be replaced. Poor filtration can cause dust buildup in your home. We will advise you on which filter is best for your unit. To inquire about our maintenance plans, please call us at 561-575-COOL or schedule your appointment by clicking here. How can I find an air conditioner unit that’s right for me? 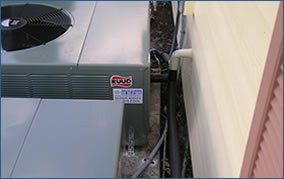 Before purchasing a HVAC system, you should always make sure your system is sized properly. We will determine the proper size and make the appropriate recommendations. Replacing an old unit with a higher efficiency rating can reduce electricity costs by 30 to 60%. How long should my air conditioner unit last? If you have a systems that has been properly size and maintained, it should last up to 15 years with minor problems. However, if the ac unit’s is not sized correctly and poor maintenance, the lifetime can be reduced by 5 or more years. Can my air conditioner help control humidity problems? Yes, air conditioners remove humidity in the air. Since it does not run all of the time, an air conditioner unit cannot remove all of the humidity. A dehumidifier may be required. It is important to maintain a normal balance of humidity; too much humidity can create mold and mildew and cause respiratory problems while low humidity may cause dry air. Copyright 2009© All rights reserved.